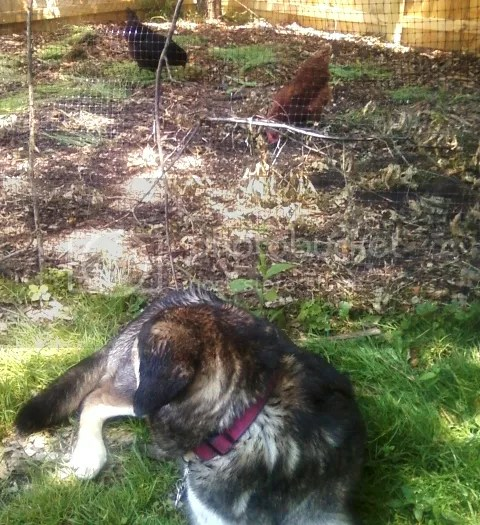 One of our dogs, watching the chickens in their pen. 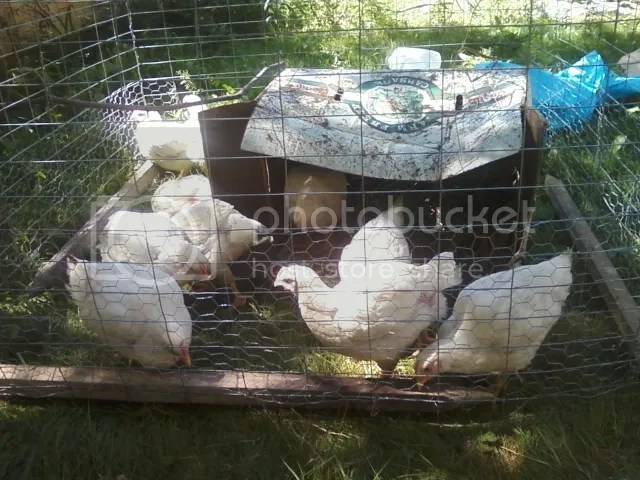 Some of our flock, dust bathing in an empty garden bed. Top to bottom; Golden Buff, Wheaten Ameraucana (rooster), two easter eggers (hatched from our eggs), Australorp. Here on the quarter acre we raise chickens for both eggs and meat. We are an NPIP certified poultry operation. Currently we keep around a dozen Easter Eggers, including a Wheaten Ameraucana rooster, and occasionally we raise a batch of Cornish Cross meat chickens. Our chickens are fed with a complete chicken feed, heavily supplemented with whole foods. Chickens are opportunistic omnivores and can eat almost anything. 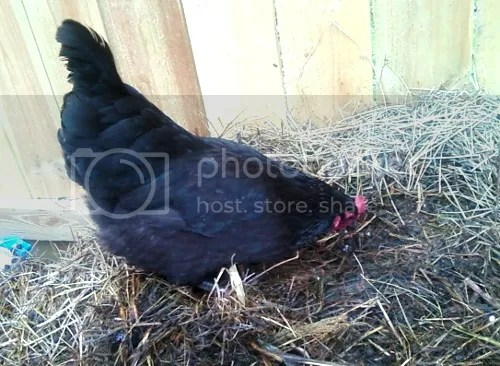 Our hens get fresh grass, greens, vegetables, weeds, table scraps, and sprouted grains… They dig through our compost piles and they consume grass in our lawn. To give them the calcium to produce their fantastic, thick shells we feed them back their own eggshells in our compost and poultry oyster shell. Our hens live on deep litter, a way of keeping chickens healthy and sanitary while encouraging natural behavior. The bottom of their pen is filled with cut grasses, wood chips, sticks, twigs, leaf litter and other carbon-heavy and biomass rich sources. The chickens scratch in this, burying their own waste and breaking down both waste and bedding quickly into a deep, rich, clean soil that worms and other bugs live and breed in. These bugs then go on to nourish and exercise the chickens as they dig through their spacious pen looking for snacks. By allowing the chickens to turn their own deep, loose litter the number of parasites and pathogens in the soil decreases drastically compared to a pen with grass or firm ground and it gives the chickens nourishment and entertainment. 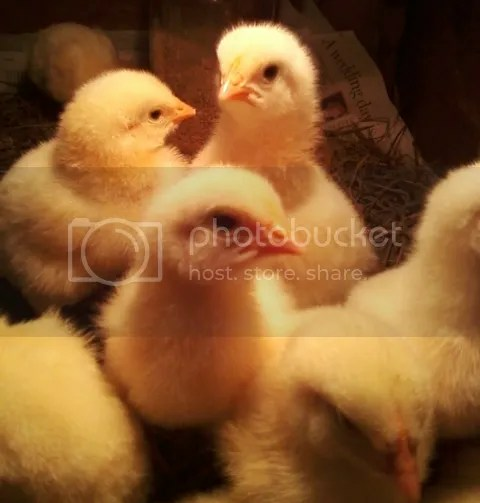 Available chicks are hatched from our own quality hatching eggs, sometimes in an incubator and sometimes under a broody mother hen. Replacement stock comes from responsible breeders across the country to avoid inbreeding. Hatching eggs are available from April through October, dependent on the weather and supply. Our flock is NPIP certified, AI monitored, and pullorum/typhoid clean. Because of our stock selection, the eggs you receive will be a variety of colors but all the resulting chicks lay various shades of blue or green eggs. Adult appearance will vary. Eggs are $1.50 each if you order less than ten, or $1.20 for at least ten. We include extra eggs in every shipment. All eggs are individually wrapped in bubble wrap, placed point side down, empty spaced are filled with newspaper and our eggs come double boxed. We have very good results and high development rates with this shipping method. Shipping costs for hatching eggs is $13 for 10 eggs or less and $18 for more than 10. We do not currently ship live chicks. Chick prices start at $4 each straight run. Availability is very limited. ALL CHICKS lay tinted or colored eggs! Baby meat chickens are purchased from a local, nationally recognized, supplier at 1 day old and are kept in a brooder for 2-3 weeks before being moved outdoors. When moved outdoors the chickens are raised in light-weight “tractors” that allow them a range of motion and natural behavior like flying, jumping, flapping, roosting, running, bathing… While giving them shelter, keeping them confined away from the egg-chickens (with whom they may fight), safe from predators, out of the gardens and allowing us to move them onto fresh, clean grass every day. All our chickens are fed unmedicated feed that is low in common allergens, and receive no antibiotics. 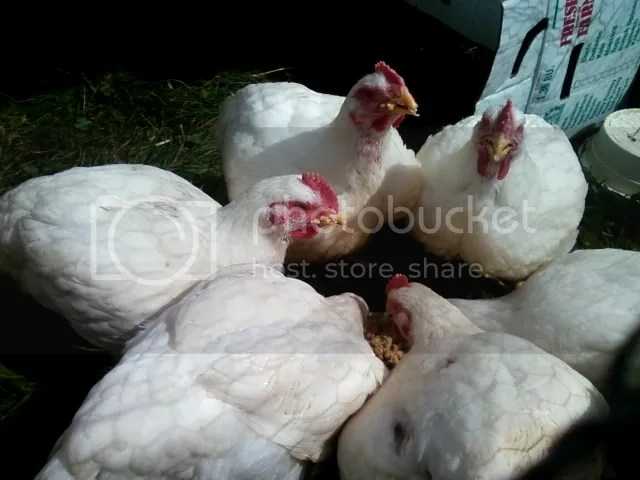 Our meat chickens are fed a wet, fermented feed filled with greens which gives them healthy, full feathers and keeps them from being dehydrated as many commercial broiler chickens are. This specialized feed also slows down their nutrient intake allowing them to grow at a slower, more natural pace resulting in none of the high mortality or lack of mobility that commercial broilers have. 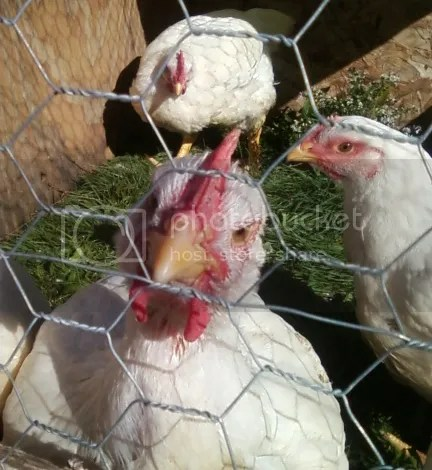 Our meat chickens are always clean, healthy birds that can walk, run and have their beaks and feathers in tact. Their slower growth, fermented feed loaded with greens, activity level and overall health gives them a flavor and texture never seen in grocery store birds… And you know that our birds are always healthy and happy poultry! If you’re interested in either our free-range eggs, hatching eggs, chicks, chickens, or processed meat birds, please feel free to contact us! We do egg shares through spring, summer and fall and we raise batches of meat chickens in the spring and fall. Please send us an e-mail for more details! I cull my own chickens. If you raise chickens, especially around here, it’s something you have to learn to do in case of injuries (usually by raccoons). If it’s 3AM and you’ve got a chicken that’s not going to recover but is still clinging on there’s only one merciful thing to do and no vet is going to see you, there isn’t anyone to come out and help. I felt like it was my responsibility to learn how to do it and be able to for that reason. My biggest tip; invest in some sort of a plucker. ANY sort. Even the little drill kind. Plucking takes forever. If you invest in one piece of equipment, make it that. If you have to opportunity and haven’t processed animals before, start with rabbits They’re very easy and hard to screw up. Great for beginners, very little blood, no feathers, and their poo is solid and doesn’t make a mess on the meat if you slip up. To Fresh Squeezed Eggs: We culled our first chicken almost a year ago. We researched over and over the most “humane” way to do this and bought a cone. That was the first. My advice a year later? Use a .22 for the “unsuspecting quickness” and use the cone for draining. The first is the hardest. Especially when you have to choose. I almost felt guilty. We don’t have to constantly remind ourselves what we buy in the store vs what we do now is a million times more humane. It’s nice to know anything on our homestead is well cared for and spoiled. There’s truth to the 4-H deal about meat tasting better when it is properly raised and cared for. 🙂 Hope this helps!